Amtrak’s Great Dome car has returned to the Pacific Surfliner for a limited time, offering spectacular views of the breathtaking Southern California scenery along our route. With upper-level windows on all sides, including facing forward and reverse, riders in this vintage rail car can enjoy 360-degree views of rolling hills, sun-drenched beaches and picturesque seaside towns. The large, domed windows allow riders to appreciate scenery that isn’t as visible from a car, such as the rugged bluffs of the Torrey Pines State Park, the coastal wetlands of the San Elijo Lagoon Ecological Reserve, the rocky hillsides of the Santa Susanna Pass and the roadless, pastoral backcountry near the Vandenberg Air Force Base. As the last rail car of its kind still operated by Amtrak, the Great Dome represents a piece of history. It is a rare opportunity for Southern California residents to get a glimpse into the past while also enjoying the views along the Pacific Surfliner route from a different perspective. Business Class tickets are required to sit in the Great Dome car, and seats are available on a first-come, first-served basis. Purchase tickets at PacificSurfliner.com and select “Business Class” in Step 2 of the booking process. Business Class riders also receive complimentary snacks, drinks and other perks. The Great Dome car will be part of our single-level Horizon trainset for a limited time. When planning your trip, refer to the table below to see which trains are expected to use this equipment. We’ll update the information as it becomes available. Dates and availability are subject to change. Follow us on Twitter (@PacSurfliners) for train status updates, including any changes to the information above. If you need to change your Business Class reservation to a different train or day, call 800-USA-RAIL prior to the start of your trip. The Great Dome car was built in 1955 for the Great Northern Railway and was brought to Amtrak in the early 1970s. After being renovated in 1985, it traveled as part of the Amtrak Auto Train between Washington, D.C. and Orlando. Since then, it has been once again refurbished, traveling across the country with various Amtrak trains. We’ll share updates about the Great Dome and other train status information on our @PacSurfliners Twitter account during its time with us. Don’t forget to share your photos with us using the hashtag #PacificSurfliner! Looks like knee-knocker seating [ug!] with the seats closest to the aisle in the first set of table seating. I had already purchased a ticket for this train. Will the dome car still be offered to me? Yes, it’s business class. Hi Toni, anyone with a Business Class ticket for a train with the Great Dome is welcome to explore and sit in it. Seats on the upper-level are first-come, first-served to Business Class riders. Please note – the trains that will have the Great Dome are subject to change. We’ll continue to update the table above with the latest information. Thanks! Please extend the Pacific Surfliner to the Bay Area! I will be in San Diego on Tuesday August 8 and would love a train with a dome car. When will the trains with the dome car on that date be available? My in-laws from Ohio are coming. This would be fun to do with our kids. Is there a dome car scheduled on August 18th or August 21st? We would go from Solana Beach to San Juan Capistrano for a day trip. We could catch the train either direction to experience the some car. Thanks. Hi Mike, unfortunately, the Great Dome car will be with us only through August 11. After that, it’s headed to the East Coast for a while. However, you can still enjoy beautiful ocean views from our other Pacific Surfliner rail cars! There are beautiful ocean views on that portion of the route. Have plans been made for Great Dome train assignments after August 6? I’ll be able to ride on August 9 and would like to make plans. Thanks for bringing this special car to the Surfliner! Hi David, we just now updated the blog with the new dates! On August 9 the Great Dome is expected to be on Trains 761 and 790 (which travels the whole length of our corridor). Should you make your Business Class reservation and the equipment changes, you can call the 800 number in advance of your trip and update the reservation. Please let us know if you have any questions, and enjoy! Thanks for the information. I’m looking forward to it! Hi David, we apologize, but due to necessary maintenance work, the Great Dome will be out of service on the Pacific Surfliner after today (August 7) so it will not be in operation on August 9. We apologize for this. If you would like to change or cancel your reservation, you can do so by calling 1-800-USA-RAIL. The good news is that the Great Dome is returning in October, so there will be other chances to ride it along our route. Do you know yet which day(s) it will be part of the consist of 582 next week? Hi Jim, as of now, the Great Dome is expected to be on Train 582 on Tuesday, August 8 next week. We just updated the schedule through August 11, so if Tuesday isn’t good for your schedule maybe one of the other trains/days will work! Need help from PSL. Arriving LA 8/16, planning to resv 2 business class to San Diego. No more Dome beyond 8/11? Oh well, suggest best time to catch sunset on either the 4p or 5p train leaving Union Sta.? Note lots of delays, perhaps 4p better. Land in LA 10am, lunch w fav niece in S. Monica then off to Union Sta. Suggestions? Will have 2 luggage to check. Hi Gloria, we responded to your other comment – looks like you are all set. You will love the ocean views between San Clemente and San Diego. Please let us know if you have any other questions! Why cant I find out how much from Simi to Fair and times? Hi Rebecca, are you looking to travel to the Ventura County Fair? From Simi Valley to Ventura, it would cost $17 each way, but we have discounts available (listed on our website) that can help save on the cost of your ticket. The Ventura Station is located steps away from the fair entrance! To plan your trip, just visit our website and click on “Tickets”. Addendum to above comment: I decided to just resv 2 Business class for the 4:08p 8/16 to accommodate for delays if any. No Dome car beyond 8/11?? is 45 min early enough to check baggage? Thanks for any assist, my husband and I are looking forward to the trip. 45 minutes is the recommended time, but if it is your first time at the station, it might be best to arrive earlier just to give yourself plenty of time. And yes, unfortunately the Great Dome will be out of service on the Pacific Surfliner soon, but it will return in October 2017! Hi – Just curious. You guys say the Dome Car is going out of service for maintenance but the Amtrak website shows it on 2 other routes starting Aug 19th. through the end of October. Isnt Car # 10031 the only Great Dome still operating with Amtrak? I would love to plan a trip on one of those North Eastern routes but trying to figure out if the car is in fact out of service due to maintenance or if it was just moved to the east coast. Hi Kevin, we can speak for the Pacific Surfliner, but for other routes, it would be best to contact Amtrak’s Customer Service and Reservations team, as they would have the latest information about the Great Dome in other parts of the country. There is one Great Dome in service with Amtrak. It was with us for a while this summer but traveled to the east coast for the fall. Hi, I’m visiting from the UK next year and wanted to do a return trip on the Surfliner with our 6 year old to enjoy the view (we are driving San Francisco to LA). I was thinking Santa Maria to Ventura and back. Will this cover the best scenery? Thanks! The segment from Ventura to San Luis Obispo is one of the most scenic sections of the Pacific Surfliner route, along with the segment between San Juan Capistrano and San Diego. 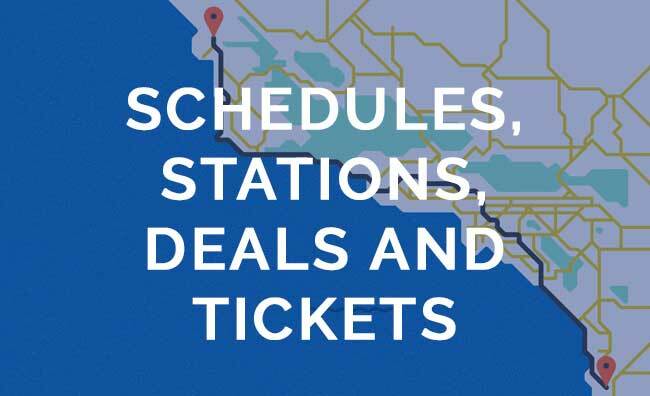 Visit pacificsurfliner.com/destinations for trip ideas. Will the dome car be leaving after January 1? Will I need a business class reservation to ride in it? I rode in it during July and needed biz class reservations. Thanks for your help.